This was originally written for a product blog of a now defunct company called TechEyes. Their website seems to be down, so I figured I’ll post it here. I thought of this because of an article I just saw on Trijicon’s IR Hunter thermal sight. As thermal sight get out there more and more, I figured I should start talking about them a little. There is so much incorrect information on these, that I am inclined to clear a few things up. I have spent the bulk of my professional career working in and around thermal imaging and I have used all manner of thermal sights in the past. However, my familiarity with thermal riflescopes available to the consumer has been fairly limited, so when I had a chance to borrow a FLIR RS32 and take it with me on a trip to Texas, I jumped at the opportunity. One of the things I plan to do is an overview of several commercially available thermal riflescopes and I will do so in a different article, but for now I am only going to discuss the FLIR sight and use it as the groundwork for the next article. Thermal sights have some advantages and some limitation. Those advantages and limitations apply to all thermal scopes, so keep that in mind while I discuss the FLIR sight. Weapon Compatability MSR semi-automatic up to .308 Cal. Digital riflescope makers try to describe what you see through them in the same terms as are used for conventional riflescopes: magnification. However, that magnification number (the thermal scope I used is listed as 1.25-5x) does not tell you the whole story. The variable zoom is purely digital: when you zoom in you do not really see a whole lot more detail since all that happens is the increase in pixelation. Now, it does have the reticle blocking less of the target, since the reticle is generated on the rear projection screen, but that is the extent of the advantage. Affordable thermal imagers do not have very high resolution yet, so unless the zoom is optical, it does not do much and variable zoom infrared lenses are quite expensive. If you want to figure out how far you can shoot something, you have to look at the resolution of the imager and the field of view (FOV) of the lens. As an example, the FLIR RS32 I used has an imaging sensor that 336 pixels wide and 256 pixels tall. Horizontal FOV is 16 degrees, which means that each individual pixel subtends 0.0476degree or, to stay with terms that most gun enthusiasts are familiar with, 2.857 MOA. That translates to approximately 2.99 inches at 100 yards. For the sake of this discussion, we can safely round that up to 3 inches. In order to identify your target, it has to be large enough to subtend at least a few pixels. This is where military purposes differ from those of a hunter. In the military application, you do not have to identify exactly each part of your target, so as long as you can figure out the silhouette of what it is you are looking at, you may be justified in pulling the trigger (and modern thermal scopes used by the military are typically of higher resolution anyway). If your target subtend 5-10 pixels, you might have enough information. For a hunter, in order to make an ethical shot, you need to see a lot more detail than that. 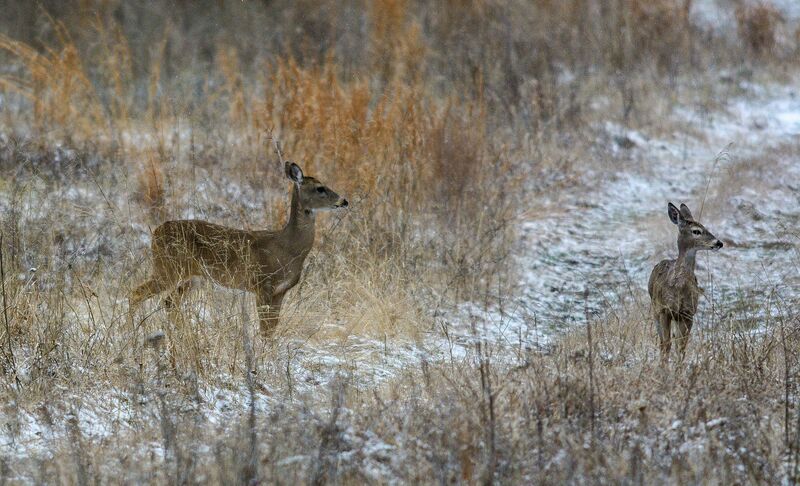 A hunter needs to be able to clearly resolve the outline of the animal and get enough information to land an ethical shot into an animal’s vitals. When I took the FLIR RS32 with me to Texas, I was after a pig, so naturally, deer were all over the place. They came out into a clearing between our blind and the feeder and I spent some time roaming all over the place giving me an opportunity to see how they look in a thermal scope at varying distances. 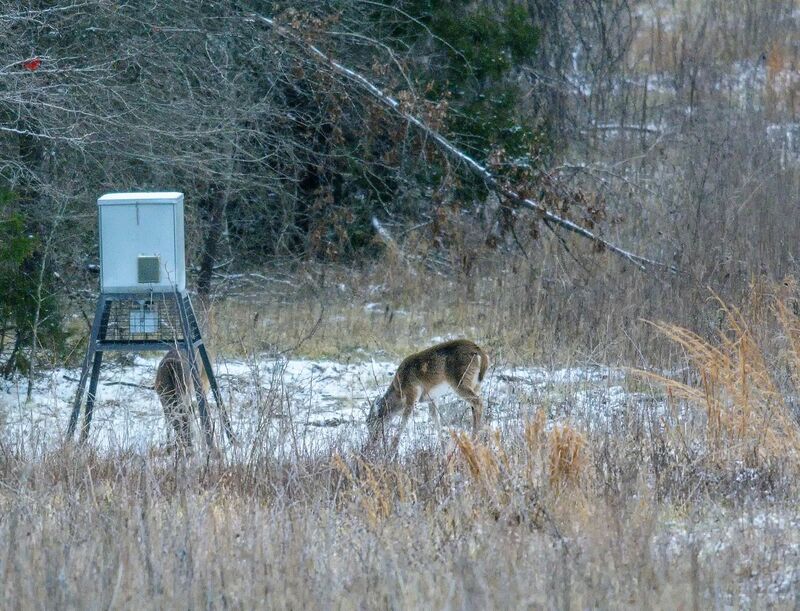 The feeder was 175 yards away from us (I had a nice Leica LRF binocular with me, so I ranged distances quite carefully), and at 175 yards, using the thermal scope I had, i would not have been able to take a shot at a deer-size animal. Here is a picture out of the blind taken with my cellphone. 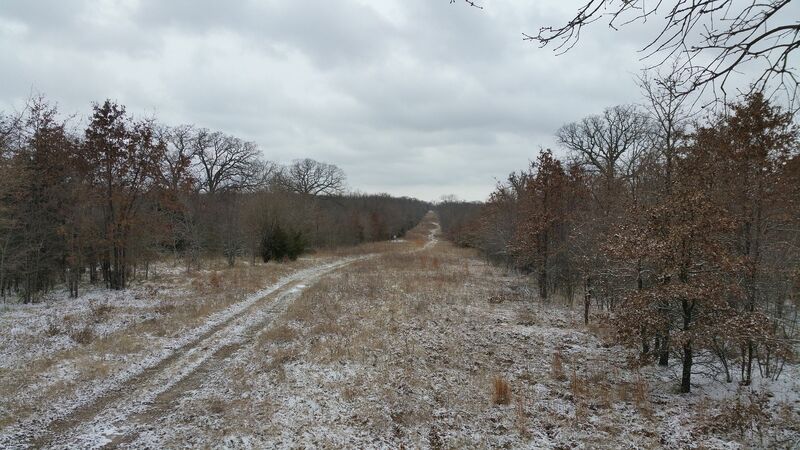 The feeder at 175 yards is the small white spot out at the distance. 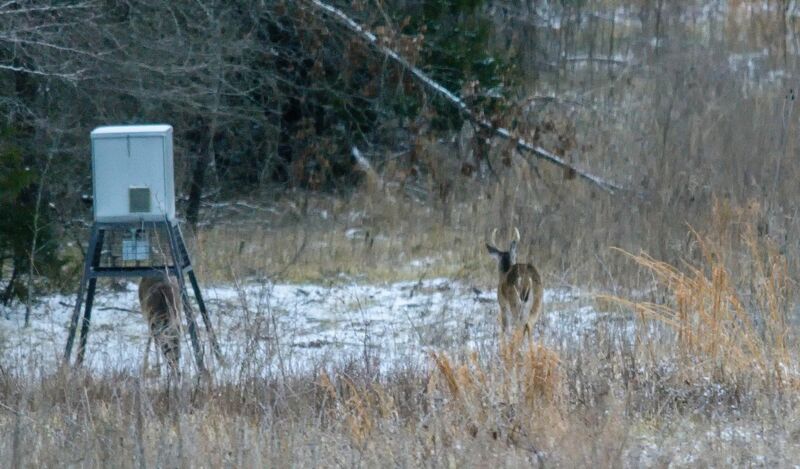 If you think of a chest size of a deer or a pig to be 18” or so, at 175 yards it subtended less than 4 pixels. That was not large enough for me to take a confident shot. With that thermal sight, I would have been comfortable taking a shot out to 50-60 yards, I think. In order to be confident of taking a shot at 175 yards, I would need a different model from the table above. Personally, based on my experience, I would say that I want the chest area of an animal to subtend more than 10 pixels for me to be moderately confident in the shot and more is better. That was a fairly interesting conclusion for me. I have a lot of mileage with thermal sights, but most of that has been in non-hunting applications where hand-held or weapon mounted thermal sights were used at closer ranges. 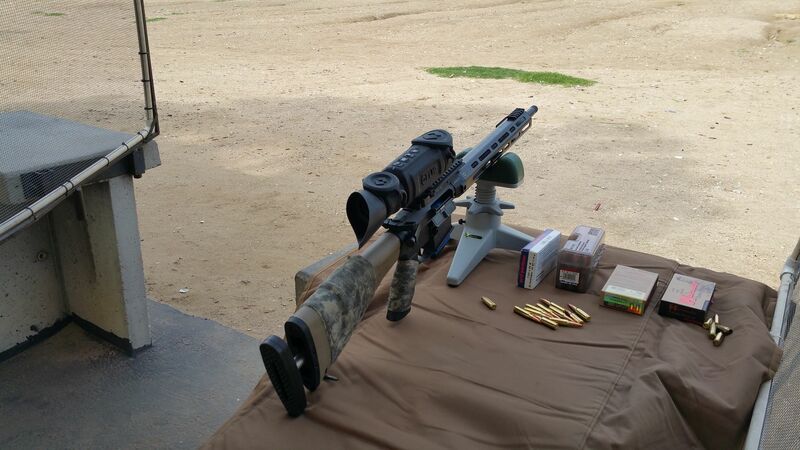 Another interesting experiment was the use of a thermal sight in broad daylight. Going out to the blind we had two guns: one with a thermal sight and another with a regular daysight. We headed out there before sunrise and stayed out until the late morning. One of the things I wanted to see was how easy it would be to see the screen on the thermal sight when it is bright out. The answer to that is that it was not that easy. With a conventional scope, the image coming through the riflescopes is typically brighter than the ambient light coming at your eye from around the scope. The reason for that is simple: whatever energy hits the objective lens is condensed onto a smaller (typically) exit pupil of the scope. 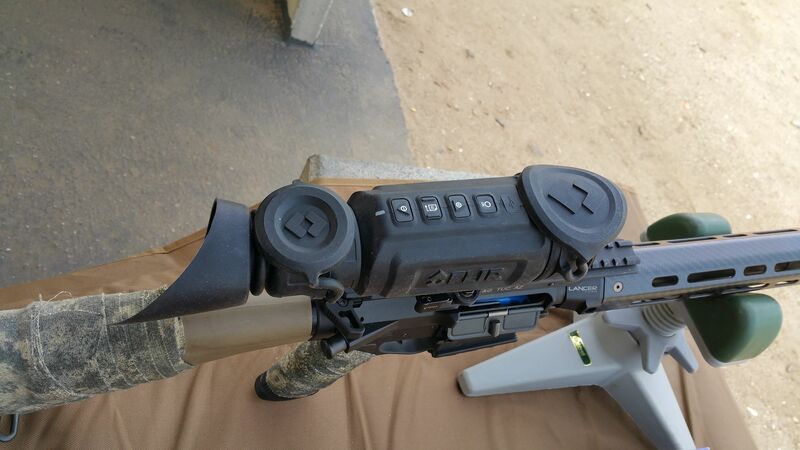 With a thermal scope, what you are seeing is a small viewfinder screen on the back of the sight. Making that screen super bright is technologically challenging and power hungry. That is one of the reasons why sights like this are primarily used at night when ambient light going into your eye is minimal. Still, thanks to the eyeshield FLIR provides with the RS32, I did not have a whole lot of issues using it during the day. Sighting the thermal scope in took a little thinking, since a conventional target is somewhat difficult to see in the infrared spectrum. On a bright sunny day, the black circle on the conventional target is at a slightly different temperature than the rest of the target paper. It can be seen with a thermal scope, but I did not trust that, so I took one of those disposable handwarmers and taped it to the back of the target. That made for a nice bright (i.e. warm) spot for me to aim at. The same buttons are used to select the reticle style. Between the two different versions of the duplex and a German #4 reticle, I chose the #4. All are perfectly serviceable though. Aside from what is in the picture above (scope, covers and eyeshield), the FLIR sight comes with a complete set of accessories: cables, chargers, recorder, etc. I played with them very carefully and, other than the charger, left everything at the camp. FLIR provides a pretty nice recorder that can be affixed to the buttstock of the rifle and connected to the sight via a miniUSB-type cable, but I do not like to hang unnecessary things on the rifle, so I largely ignored it. It works well and is a good accessory for those who want to record their shot. However, personally, I would rather have a card slot for the recorder incorporated into the body of the scope. That is just a personal preference though. Battery life of the sight was better than I expected. I was worried about and left the auto shutoff on. That ended up costing me a shot, since the only time I saw a pig during my trip, the sight was shut off and while I was turning it on, the pig ran off. Technically, I do not know if I would have had the time to get a shot off, but I like the idea of blaming the sight rather than myself. Having had this experience, I think I would have rather set the rifle up with a clip-on thermal sight than a dedicated thermal scope. For night time use at reasonably close distances, this thermal sight is a great option. However, for longer distances or daylight applications, I would have rather had a conventional scope.